Project Description: The Serv-U project is the largest ecommerce project that Six Demon Studio has undertaken to date with the catalog of products reaching the twenty-five thousand mark and the site requirements being extremely in-depth and involved. The project was further complicated by the need to migrate existing data from a different ecommerce platform that Serv-U had out grown and a third party account & inventory management system that was to remain in use. In short, the project was far from the typical installation package and it was a challenge that we were looking forward to taking on. After lengthy discussions to determine what functionality the new site would need, SDS designers set out to give Serv-U a bold fresh look with a completely new site design. The size of Serv-U’s catalog quickly made it apparent that there would be a need for a custom designed navigation interface rather than the standard Magento navigation. The solution was a horizontal navigation with large drop down tab to display the secondary and trinary categories as well as a special “clearance” filter. The navigation allows customers to quickly navigate a large catalog of products without having to go through several layers before getting to the type of products they are shopping. 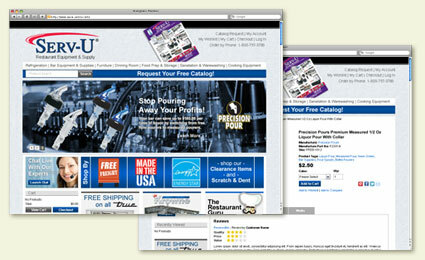 This easy navigation style is expected to enhance the customer experience and increase conversion. One of the goals of this ecommerce redesign was to allow customers the ability to shop the catalog in whatever manner they wanted, while remaining easy to understand and maneuver around. To help accomplish this, in addition to the custom horizontal navigation, special filter navigation was included to give customers the option to shop items with Energy Star rebates, feature free freight, made in the USA or by specific manufacture. There was concern that shopping by one of these special navigation methods would be extremely messy as the item list would be extremely broad and it would be unlikely that a customer would be looking to buy an item based simply on one of the special methods. The solution to this issue was easy to use filtering methods to quickly narrow down the lists into those items that the customer is actually trying to find. 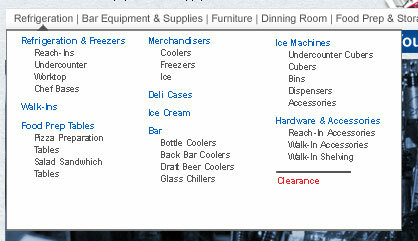 For example, if a customer was looking for catering equipment that had free freight initially they would see every item in the catalog that had free freight, but would quickly be able to narrow that list down to only catering equipment that has free freight by easy to use product filters. Another area of the installation that required custom Magento modules was the freight calculations. Due to Serv-U being a restaurant equipment and supply company the methods used to ship items to customers range from UPS, freight carrier or drop shipping from the manufacture. This coupled with other shipping concerns required custom shipping logic to correctly calculate shipping costs. Incorrect shipping costs was one of the major areas of concern for Serv-U as the previous ecommerce installation was unable to support their complex shipping methods and was one of the main causes of customer complaints. Outside of the Magento framework there were also two specific concerns that needed to be met. The first was the need to migrate large amounts of customer data from the previous ecommerce installation that had been in place since 2005 to the new installation. A one-time use custom script that successfully moved everything Serv-U needed to keep handled migration of the data between the two different platforms. The second issue that needed to be addressed was the presence of accounting & inventory management software that was already in use by the client. Custom order export scripts were written to transfer orders placed via Magento in real time to the software, while nightly jobs were put in place to sync up item pricing and other data that includes shipping tracking numbers. Usability and search engine optimization played a large part in the over all design and installation process of the new Magento based ecommerce launch with social media and other forms of media being involved in the process from the start instead of tacking them on as an after-thought. Each product had the ability to feature product video, sales spec PDFs, social media sharing icons and Serv-U’s print catalog PDF page in one convenient location for the customer to find. Having all this information in one easy to find place helps prevent customer frustration and make for a better shopping experience. A custom media manager was build into the back end of Magento to allow administrators and easy method for managing all the media.